This article was first published by Moneyweb. US investors consistently earn lower returns than the market and the funds in which they invest. This gap in performance is known as the behavioural penalty, and it’s big and relentless. Figure 1 shows that $100 invested in the S&P 500 in 1996 would have grown to $480 by the end of 2015. The average investor’s $100 would have grown to only $250. Although this research is US-based, there is no reason to believe that investor behaviour in the rest of the world is any different. Generally, this poor performance is due to lack of persistence. The behaviour most responsible for causing the performance gap is investors switching funds – moving from funds that appear to be underperforming to those that appear to be performing better over short periods of time, with little regard for any investment plan. It isn’t a result of investors choosing poorly performing funds, because the average equity fund delivered better returns than those earned by investors. A report by Vanguard, Setting the record straight: Truths about indexing, shows the distribution of equity funds’ excess returns relative to their benchmarks for the 15 years ended 31 December 2016. This is also US-based research, so it’s comparable to Figure 1 above, which shows that investors underperform the market by 3-4% on average. Morningstar data on South African equity fund performance reveals that best-in-class performance is inconsistent. Top-performing equity funds over relatively short periods such as three years are unlikely to maintain top relative performance over the following three-year period. It is no surprise that the Financial Sector Conduct Authority insists that every fund manager include lengthy disclaimers in all investor communication about past performance not being a guarantee of future performance. We do however observe some consistency in the top half of the equity fund performance distribution. Based on the same Morningstar data, history shows that an equity fund that delivered performance in the top two quartiles has about a 30% chance of remaining in the top half of the distribution for another three-year period. Quartiles are a statistical measure based on dividing data into quarters. In this case, the performance of funds relative to their peers is ranked and divided into four quarters, with quartiles one and two representing the top half of funds and quartiles three and four the bottom half. If chance alone dictated whether a fund is in the top two quartiles for two consecutive three-year periods, the probability of the fund achieving this outcome would be 25%. 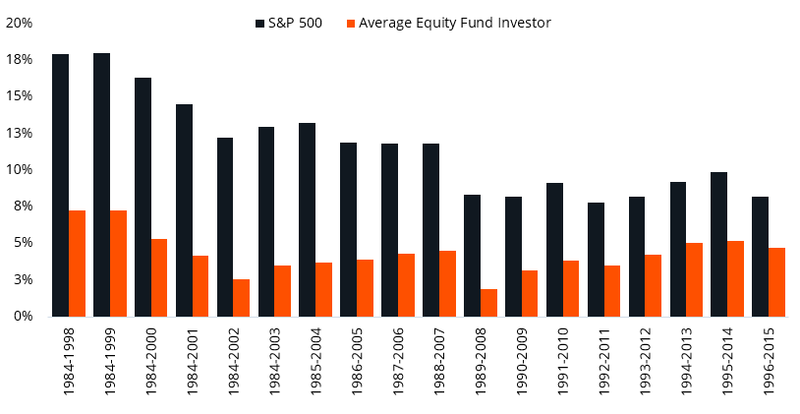 Only a small number of equity funds have, however, been able to deliver superior returns over the long term. The data suggests that some fund managers deliver better-than-average outcomes with some consistency. Figure 3 below shows the ranking of equity funds over two consecutive three-year periods. If past performance of funds did guide future performance, we would expect to see a tight grouping of funds around the dotted grey diagonal line, included for illustrative purposes. We do see a slight tilt in the data (the dotted orange line), which shows that there is some consistency – i.e. 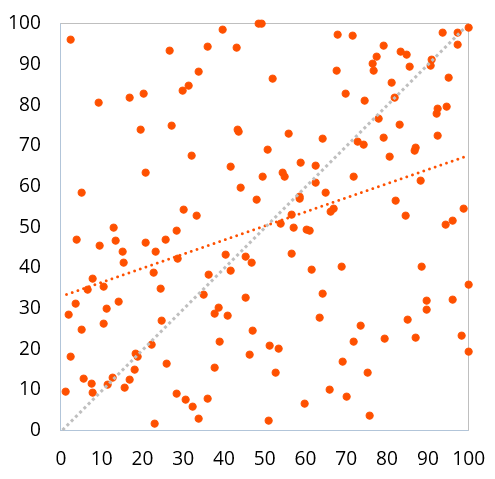 past performance does help – but the wide spread of the dots around the orange line indicates that future performance is not guaranteed. The fact that there is some consistency nevertheless shows that there are skilled fund managers that do better than pure chance would suggest. This can mostly be ascribed to a tried and tested investment philosophy that, when applied consistently, improves the odds of the fund manager doing better than its peers. Four simple guidelines to help investors improve their outcomes. 1. Define an investment goal. Whether it is drawing an income for retirement, saving towards retirement, saving for emergencies, buying a house, or paying for a child’s education or a holiday, you should always have an investment goal for each portion of your savings. Being clear about one’s investment goal will make it far more likely that you will invest in an appropriate product. The right product increases the likelihood of earning your required return and will hopefully reduce your inclination to switch from one product to another. 2. Choose the appropriate asset class to meet your goal. Different assets are subject to different risks and therefore are suitable for different investment goals. For instance, equity market returns are too uncertain for short-term savings goals. In contrast, if you are saving for retirement, in 20 or 30 years’ time, a substantial allocation to equities would be suitable. Figure 4 highlights the importance of being clear on your investment goal and matching this to the appropriate asset class, because it dictates the investment horizon. From left to right each dot represents the average return realised over 1-, 3-, 5-,10-, 15- and 20-years for each asset class plotted against the lowest return realised over the same time frame. 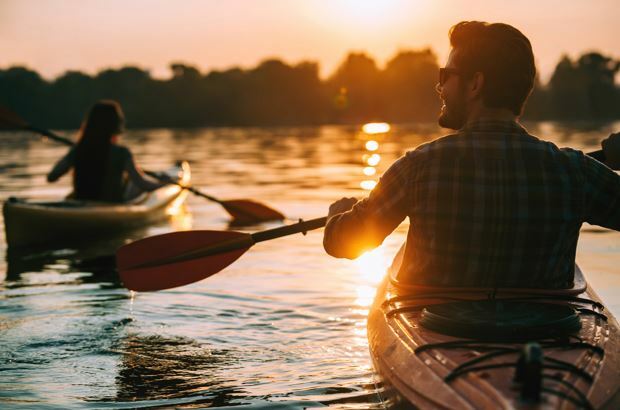 Only cash is appropriate for an investment horizon of less than a year because it hasn’t resulted in capital losses over a one-year timeframe. 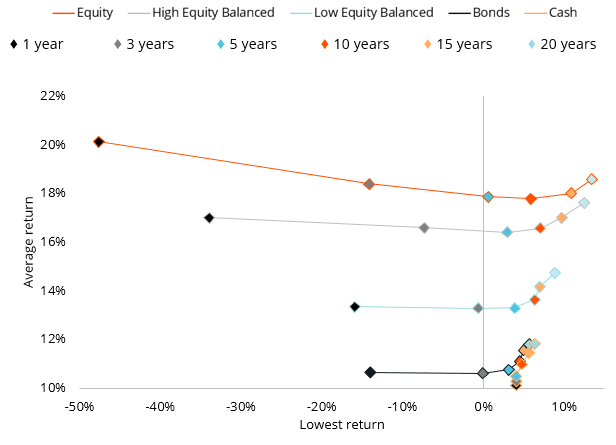 Bonds generally require a three-year investment horizon to guarantee positive returns, and equities require five years. Over the long run, equities are expected to outperform, but the large swings in the prices of equities make it an inappropriate savings vehicle for short investment horizons. Source: Denker Capital, using data from the JSE. All data post 1960. For illustrative purposes only. ‘High Equity Balanced’ consists of 60% domestic equities, 25% domestic bonds and 15% foreign equities. ‘Low Equity Balanced’ consists of 25% domestic equities, 20% domestic bonds, 30% domestic cash, 15% foreign equities and 10% foreign cash. 3. Choose a product provider you believe will help you meet your goal. Choosing an investment manager that is most likely to help you achieve your investment goals is important. This involves understanding how they aim to achieve returns and the likelihood of them doing so. It is for this reason that we often urge investors to understand an investment manager’s philosophy. A tried and tested philosophy, consistently applied, can deliver on expectations. There are some poor-performing investment products, but only a small fraction of equity funds does as badly as the average investor. Chances are that by picking three or four fund managers in the top two quartiles (and sticking with both your equity allocation and funds) will earn returns that are far closer to the returns delivered by the market. To earn the best possible returns, investors need to remain invested for the duration of their time horizon. There are times when switching from a poorly performing product into a top-half performer will benefit you, but it takes a lot of skill and perfect timing – and most probably a bit of luck – for this to pay off. The evidence shows that only a small fraction of equity fund managers delivers returns as poor as the returns achieved by investors who switch their investment choices in response to the latest news. Strange as it seems, this appears to put investors as much in control of their outcome as their investment manager! Now that is food for thought. Despite short-term volatility, we believe emerging markets will continue to generate long-term outperformance →← Is the tide changing for active value managers?